Have you ever heard the expression, “If the shoe fits, wear it!” It means if something applies to us personally, we are to accept responsibility and acknowledge it. I have worn several different types of shoes in my lifetime. some bring back positive memories, others the reverse. There are many types of shoes in my closet and my spiritual garment bag, each is for a specific purpose. I have a painting of Moses and the burning bush above my bed. It illustrates Moses’ surrendering to God’s call. When Joshua met the commander of the Lord’s army before the battle of Jericho, he too was asked to remove his shoes. Removing the man-made sandals was a reminder that nothing we can or will do qualifies us before God. We come into His presence by grace alone. Like Moses, God asks us to lay aside human effort in surrender to Him. Sandals are my favorite footwear, slipping easily on and off. Their comfort, ease and simplicity exemplify the warmth and freedom of summer. My response to God’s invitation to draw close and submit to His leading, should consistently be quick and humble. Humble hardly describes my next illustration! My husband and I recently moved from farm to city. Everyone in our wonderful new church dressed classy. I mean really “put together”! My laid back country-style hardly qualifies as either classy or put together. One Sunday I made special effort to rise to this new standard. Checking myself in the mirror before we left home, I thought, “Yep! Looking good!” On getting out of our vehicle at church, however, I noticed one minor problem. I forgot to change shoes. My feet were clad with fuzzy blue slippers! I know God laughed, even before my husband did! The laugh was appropriate. I was taking myself way too seriously! Or admit my blunder, swallow my pride, laugh with God and give a few other folks a bit of a chuckle too! I actually chose the latter, learning an important lesson! “…And what does the LORD require of you? I think God would like to write this verse permanently across my forehead as a reminder to never remove shoes of humility. Instead, He has written it upon my heart. Spring time on the farm required special footwear to navigate the challenges of muddy yards. Mud-walking has two potential hazards: slipping and falling, as well as losing a boot in the suction like grip of the muck. Unfortunately, I have experienced both! drunkenness, orgies, and the like. On the farm, it was always a relief when the season changed and boots could be stowed away. The comfort of walking sure-footed on dry ground was a relief! Though an apt illustration, it doesn’t compare with the difference between walking in the flesh and walking by the Spirit. God has more for us than mud walking! The best looking shoes may not be the most practical. Shortly after the release of “Olivia & Me”, I had the honour of being a guest on “Talk of the Town” with Lisa Peters. Just before air time she sat down and put on her best looking shoes. She laughed explaining they were very good sitting shoes, but a little dangerous for walking. my personal bravery, and my invincible army. Maneuvering through trouble, suffering or increasing responsibility requires faith. The feet of a mountain goat has a hard outer shell and a rubbery, concave foot pad which acts like a suction cup. This helps to cushion their feet when they leap from rock to rock. Incredibly, they are also able to pull themselves up from ledge to ledge with their front feet. Lisa’s shoes were a beautiful accent to her equally wonderful personality. Can we honestly settle for only looking good when God has given us strength to climb with faith? He wants us to be able to leap and overcome seemingly impossible obstacles. Serious runners need shoes of tenacity and endurance to run and finish strong. Our city hosts an annual marathon luring runners of various capabilities. Avid runners train through the heat of summer and the cold blast of winter. They are focused! Each runner wants to reach their peak finishing the 42 kilometer course in their best time. There are also those who don’t understand the benefits of training. Their bodies groan under the stress for days after the event. Endurance is developed in the training; the benefits will not be seen until much later. The word, ‘shod’ reminds me of the process of shoeing horses. Pleasure horses don’t need shoes; serious work horses do. The farrier trims each hoof, grinds down rough edges and cleans away any debris, before nailing each perfect fitting horseshoe firmly in place. The Greek word “shod” comes from two words mean “under, beneath, inferior position” and ” to bind, be in bonds, knit or tie.” Acknowledging Jesus as Lord over our lives is part of the binding and preparing. “Honor Christ and let him be the Lord of your life. The Roman soldiers maintained a secure foothold because they wore heavy sandals studded with hobnails. They were able to stand firm in any combat situation. The best stance is the one provided by the peace we find in Jesus. As Christians we wear many different types of shoes. These are only a choice few. I haven’t mentioned shoes of compassion and mercy, or shoes of justice and righteousness. We need to be ready to pull from our spiritual garment bag whatever is necessary to re-present Christ well to our generation. 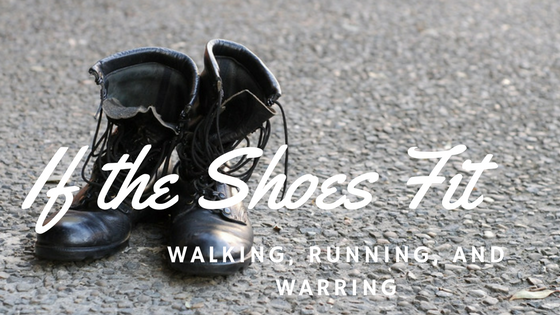 Whether walking, running or warring, the shoes God has provided fit. Let us wear them well! ← Your Time Will Come! Be Ready! Be Prepared for Every Good Work!